How much does it cost to travel to Corfu? How much money will you need in Corfu? €91 ($102) is the average daily price for traveling in Corfu. The average price of food for one day is €27 ($30). The average price of a hotel for a couple is €78 ($87). Additional pricing is in the table below. These average travel prices have been collected from other travelers to help you plan your own travel budget. 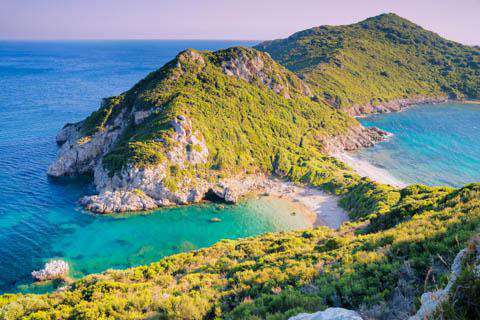 Also known in modern Greek as Kerkira or Kerkyra, Corfu is the northernmost of Greece&apos;s Ionian islands, located off the nation&apos;s northwest coast in the Adriatic Sea. It has historically seen control of Venetians, French, and British powers, and today draws tourists mainly as a resort destination. As far as historical sightseeing goes, the Old Town of Corfu has several locations worth visiting. The first to see is the Old Fortress, located on the eastern point of the Corfu town peninsula and separated from the rest of town by a moat. In the 16th century, the fortress was built by the Venetians on the site of an old Byzantine castle. Another important area is the Esplanade, a large open park situated between the Old Fortress and Old Town. It is bordered to the north by the old royal Palace of St. Michael and St. George that now houses the Museum of Asian Art. To the west is the Liston-a Venetian promenade with arcaded terraces that house charming cafes. The main shopping street in Corfu Old Town, Theotoki Nikiforou Street, connects the Esplanade by the Old Fortress with the New Fortress, another fortified Venetian castle on the western end of town. Here and on other major roads visitors can buy Greek crafts such as olive wood, ceramic, and leather products, as well as goods like locally-produced wine, honey, and olive oil. Corfu town is the hub of activity on the island. It is the largest town and home to the airport, as well as cruise ship and ferry docks, and amenities for tourists. The northern part of the island is the widest and most mountainous with a coastline of pebbly beaches, while the southern part of the island is narrower with sandy beaches. In addition to Corfu town, there are many other villages on the island. Benitses, for example, is a former fishing village that has since developed into a tourist economy with a coastal road lined with hotels, restaurants, cafes, and other shops. Corfu&apos;s oldest village is Old Perithia in the northeast. Situated below Mount Pantokrator, the village is a designated area of natural beauty and protected heritage site. Also in the north is the traditional fishing village of Roda, now a popular resort destination. Other well-known locations include Nymphes for its waterfalls, Kynopiastes for its 17-19th century mansions, and Lakones for its picturesque views over the bay. Since Corfu is a resort destination, many visitors come to enjoy the island&apos;s beaches. Paleokastritsa is the most famous and probably most picturesque beach resort on Corfu. Large cliffs surround the coast and many sea caves nearby can be visited by boat. Sidari is another resort beach, especially popular with British tourists. It also has sandstone cliffs with narrow inlets, a natural archway, and small footpaths for exploring. Kassiopi is another relaxing escape with calm waters, but for a quieter option away from the tourist attractions try Chalikounas beach. Other activities on the island include exploring the historical sites of Old Town, walking the coastal towns and villages, enjoying the natural scenery, golfing, boating, and a variety of water sports. Cuisine of Corfu, and Greece in general, is dominated by local products, including meat, fish, olive oil, vegetables, honey, yogurt, and cheeses that are always fresh and of the best quality. Meals often begin with Tzatziki (a dip made with yogurt, cucumber, garlic, and other herbs) and Horiatiki (a salad prepared with tomatoes, cucumbers, onions, peppers, Feta cheese, black olives, and olive oil). Being an island, many of Corfu&apos;s main dishes will center on seafood-examples include Bourdeto (fish soup), Bianco (cooked with wine, lemon juice, garlic,and vinegar), and Savuri (fried fish served with a garlic sauce, rosemary, vinegar, and raisins). Other main dishes include Sofrito (veal cooked in wine sauce, garlic, and white pepper), grilled lamb, and other meats grilled with herbs and olive oil. For a quick bite, be sure to visit a bakery for any variety of meat, vegetable, and cheese pastries or grab a pita gyro (filled with pork or lamb roasted meat, French fries, fresh tomatoes, onions, and tzatziki). Baklava is a Royal dessert all over Greece, made with nuts and honey, while something more unique to Corfu is gingerbeer, which was adopted from the British and is locally called "Tsitsibeera." Corfu International Airport or Ioannis Kapodistrias International Airport is served by several airlines, including Aegean and Olympic, which both have flights year-round to Athens. In the busy season the airport also offers flights with German Wings, Easyjet, Air Berlin, TuiFly, LTU, Ryanair, Transavia, and Wizzair. The city center of Corfu can be reached from the airport by taxi, shared shuttle, or by booking a private car. A taxi from the airport should cost about 10 euro. Bus number 15 also provides transportation to Corfu town.